The career of Argentinean actress-turned-singer Juana Molina has followed an unusual trajectory. Star of the comedy series Juana Y Sus Hermanas (Juana And Her Sisters), a smash-hit in the Spanish-speaking world, Molina’s turn as a singer and producer of lush, looping electronic music was a bit of a curveball; think Julia-Louis Dreyfus suddenly becoming Björk. But this isn’t a vanity project. Music was her first love, and she actually started acting to pay for music lessons. Her latest, Un Dia (One Day), is another set of inviting, hypnotic coils of sound. 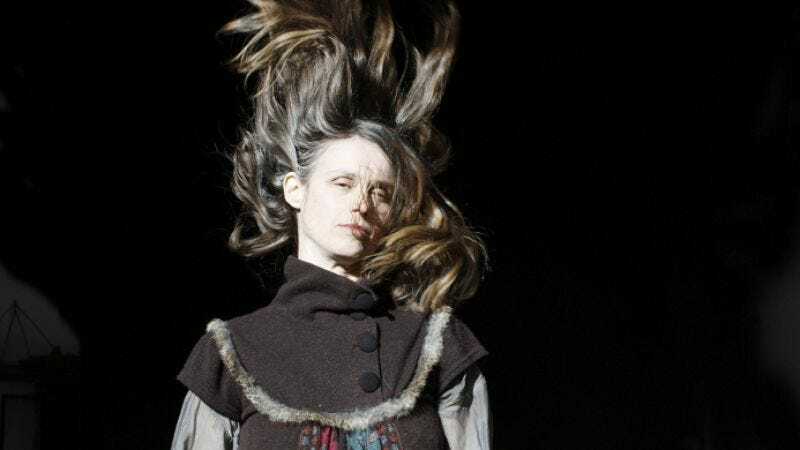 Set to play Morse Theater Feb. 22 on her first U.S. tour with a band, Juana Molina spoke with The A.V. Club about noise receptors, foreign sounds, and musical embryos. The A.V. Club: You started acting to fund your music lessons. Were you a good student? Juana Molina: I was a very good student for a few years. I’d spend six hours a day or more playing, learning new things. In the middle of the studying process, I would always get an idea that would lead me to a song, a new little thing I would record on a tape recorder. I ended up with many cassettes, with beginnings, embryos of songs. I called them invento, inventions, because they weren’t really anything finished. For my first three records, I came back to those cassettes and took some ideas from them. AVC: How important is it for you to make mistakes when you’re recording? JM: It depends on the mistake. Some of them become the greatest things in the song. The only way to make mistakes is just to let yourself go and do whatever comes to mind. That’s one of the main reasons I like to work on my own. There are no witnesses to all the crap I can do. AVC: How much of the sounds of your immediate environment in Argentina are in your music? In previous interviews, you talked about how the elevator going up to your grandmother’s apartment made some very influential noise. JM: I’ve always thought we have some kind of reflectors in our bodies that are sensitive to certain sounds, and we all have different ones. Everything that comes from the outside just awakens these receptors. Different things are awakened according to the influences you’re exposed to. My sister is a musician as well. We grew up listening to the same music and what we do now is completely different. As far as that elevator, I think there was always something about drones and very steady rhythms, rhythms that make you move. Even if it’s just the tip of your finger, that’s enough for me. AVC: Do you find there’s a big difference between Americans and Argentines when it comes to jokes and their respective senses of humor? JM: When most people in the States tell a joke, they then tell people they’re kidding or it’s a joke. What is a joke if you have to explain it? It’s weird. There’s some kind of extra politeness going on. That wouldn’t happen in Argentina. They would get it or not, but you wouldn’t say you’re joking. The sense of humor is the last thing you catch when learning a language. It’s deeper than the language itself. Juana Molina performing "Micael" at the Lakeshore Theatre in 2006.